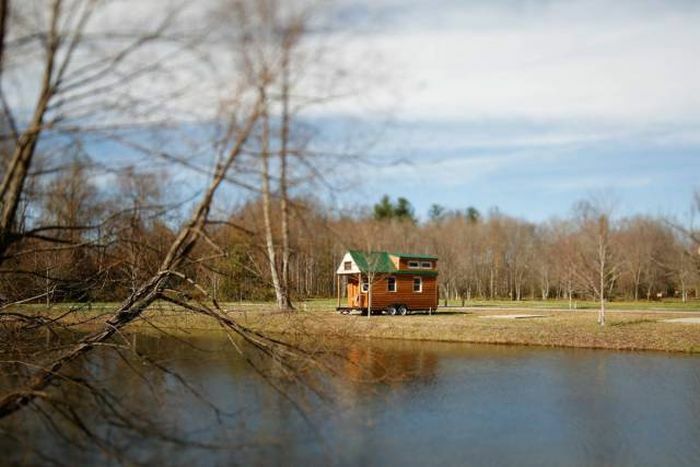 Alexis Stephens and Christian Parsons built an incredible house for themselves. It may not be the biggest home but it's definitely special. 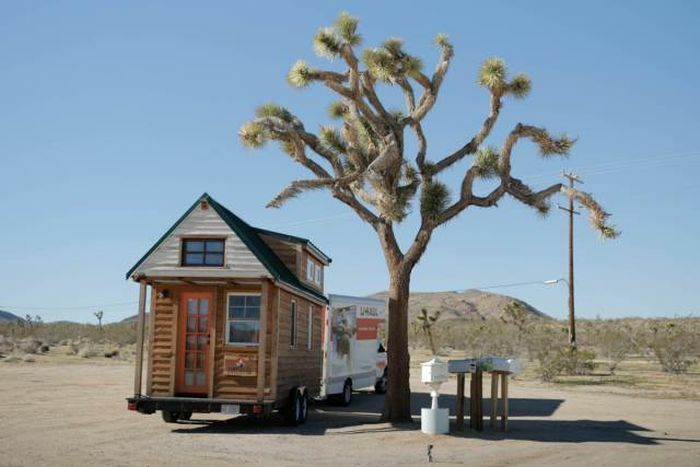 They built the house on a small budget and made sure that it's mobile. 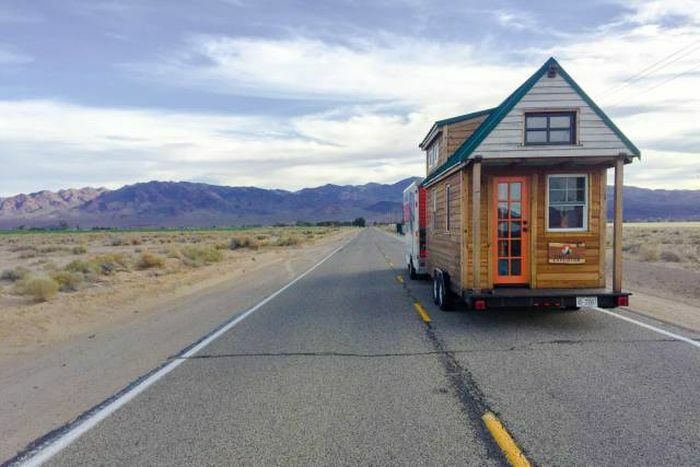 Now they live inside the house but they never stay in one place too long because they live to travel. "I’m a recovered pack rat," Alexis says. 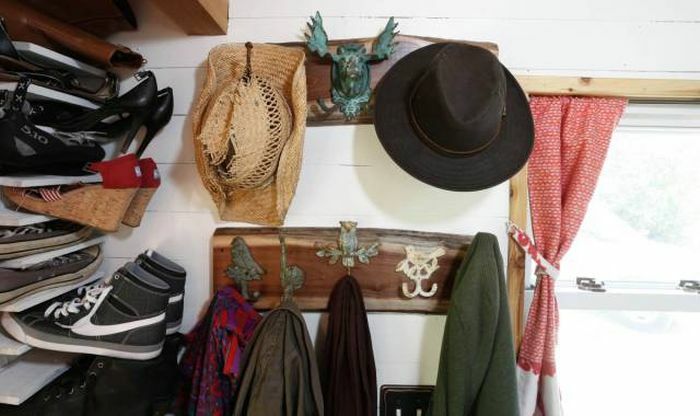 "For me, I wanted to make a lifestyle decision to simplify my surroundings." 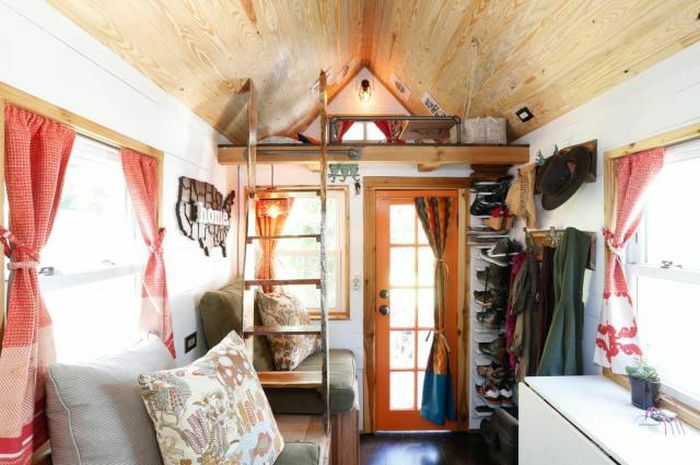 The tiny house presented the perfect solution. About a year ago, her partner Christian broke ground on the home of their dreams. Christian was no stranger to renovations. His dad worked on every house the family lived in for "almost the entire time we lived in it." 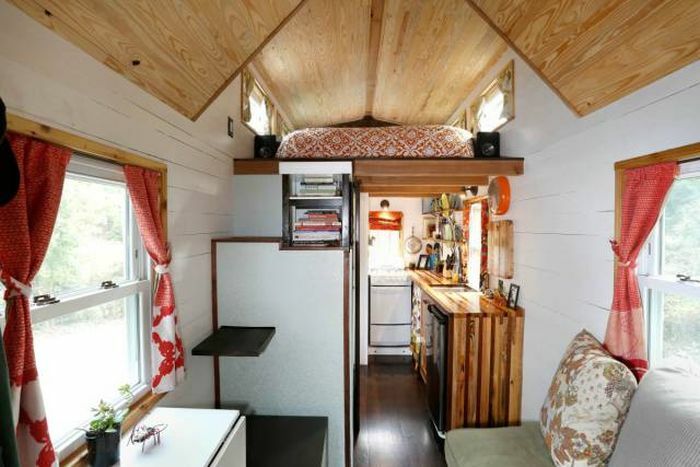 At 130 square feet, the house has a rustic cabin meets Pottery Barn catalog feel. 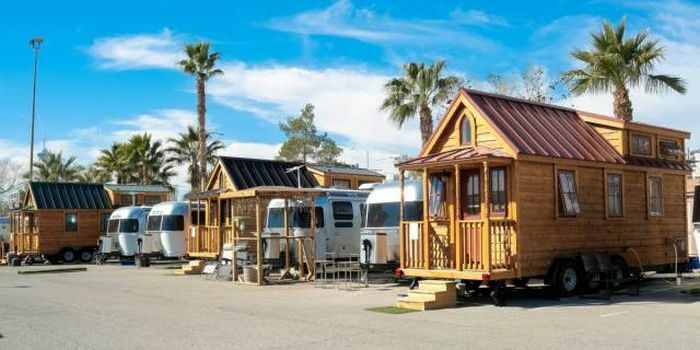 It cost under $20,000 to build. Most materials are recycled. The wood was salvaged from a farmhouse set to be demolished, and the curtains came from scraps found at a furniture show. "I like to cook so it was important for me to have more than a cooktop," Alexis says. 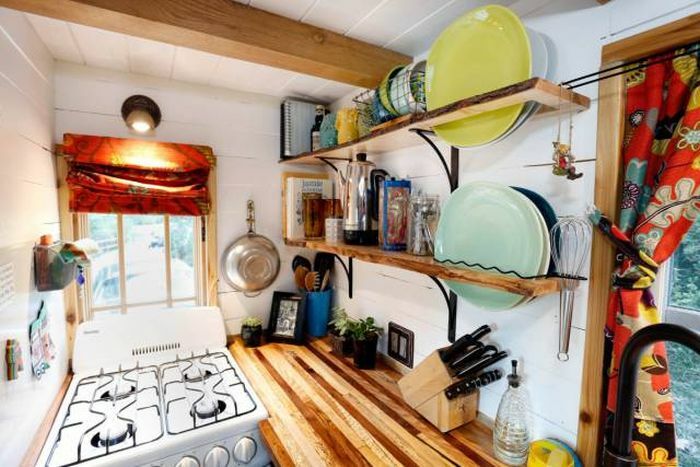 The full kitchen includes a fridge and an oven. 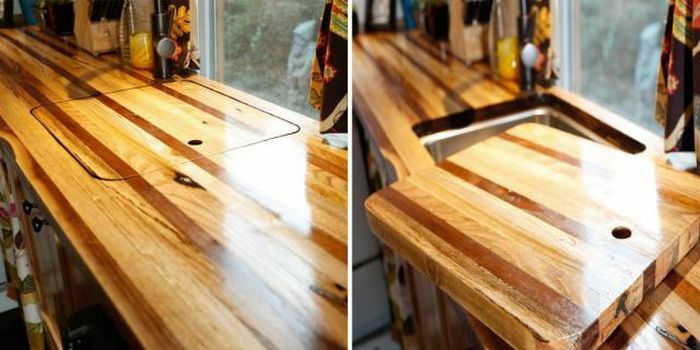 Christian handcrafted the butcher's block countertop from five different kinds of trees that fell in a tornado in his parent's backyard. 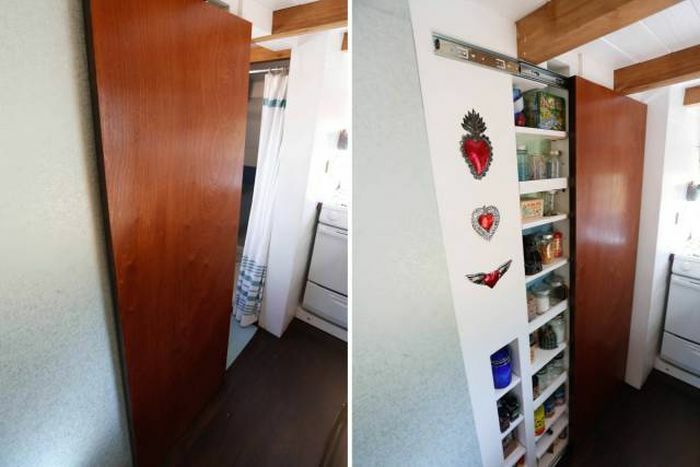 The bathroom door slides to reveal a full-sized pantry. "To be surrounded around the things you love and need [makes] your daily living experience ... a little more joyful," Alexis says. The couple splurged on space for the shower, as well. 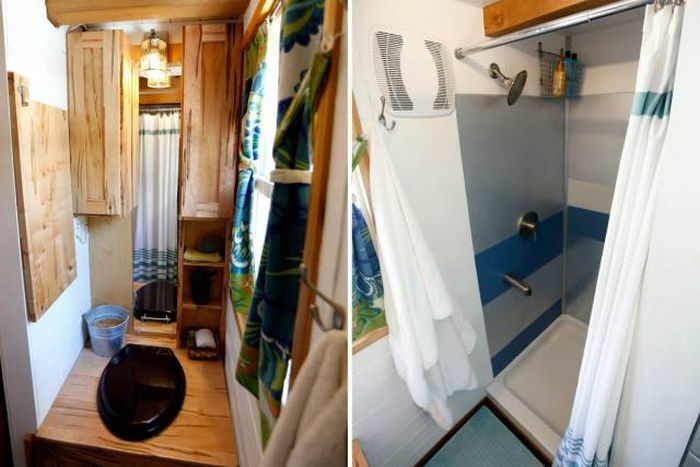 It's 34 by 36 inches, larger than most tiny house showers, and includes a tub for "feet washing." The master's suite is located in a loft upstairs. 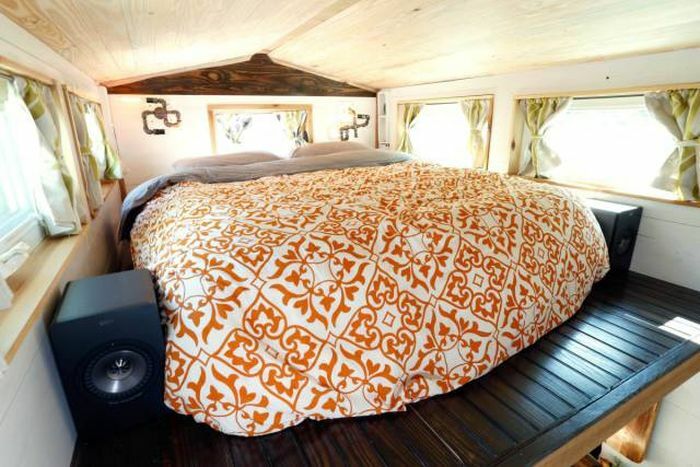 It has a queen bed and an abundance of windows, which helps make the tight quarters feel a little more spacious. Even the lighting fixtures offer a small way to personalize the home. 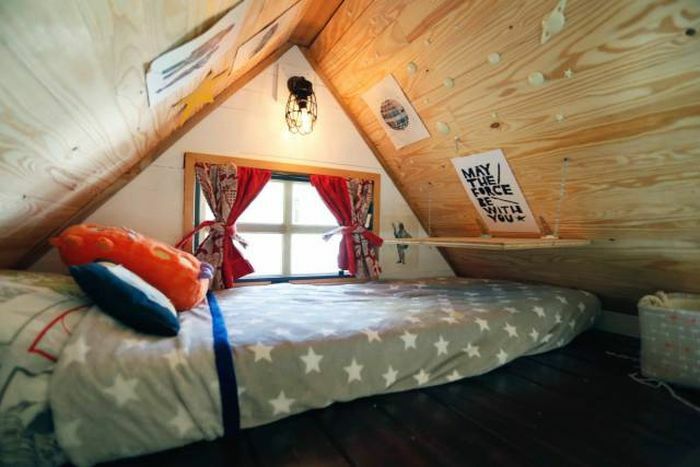 Across the way, there's a second loft for Alexis' son. 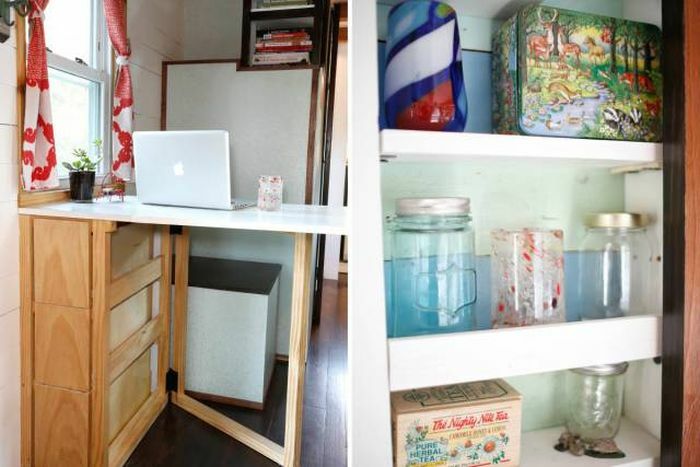 It's decked out with glow-in-the-dark stars and a drop-down desk. A curtain divider gives some privacy. 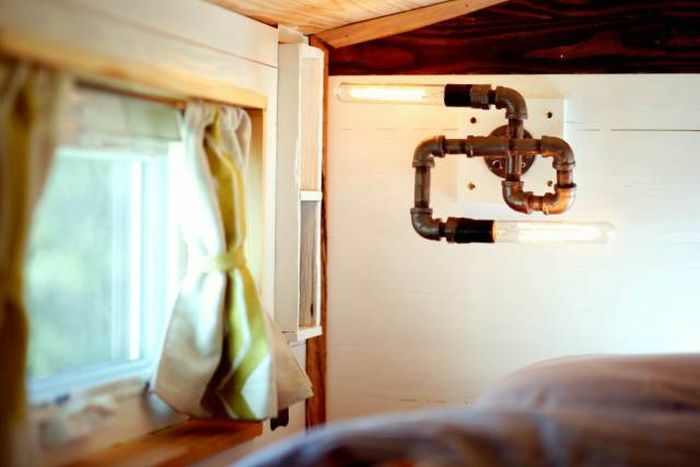 Before the couple even started building, they knew they wanted to travel in the house. 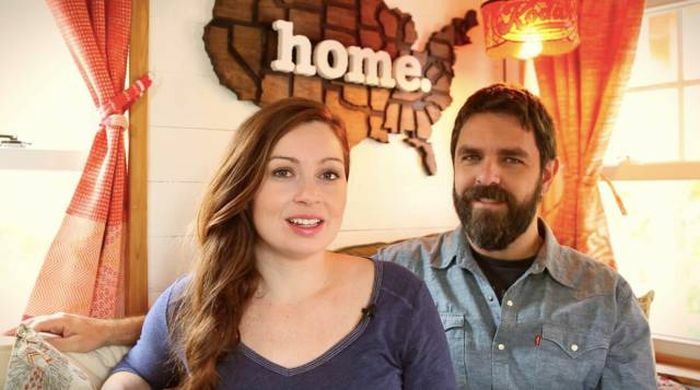 Alexis and Christian work as documentary filmmakers, and saw an opportunity to tell other tiny homeowners' stories. They're now one year into shooting. 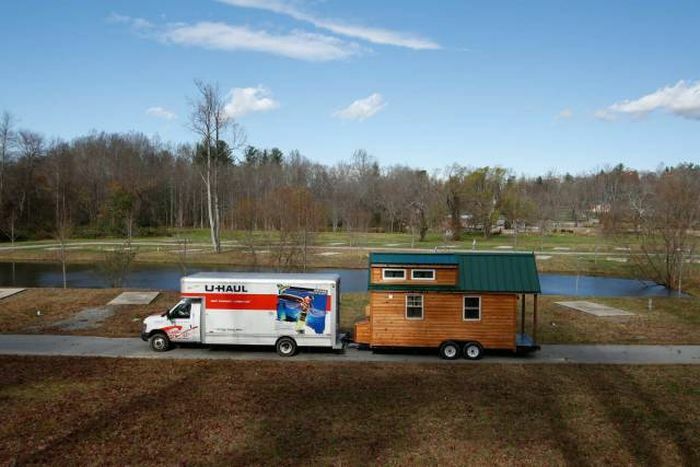 They've already towed their tiny home through 16 states. 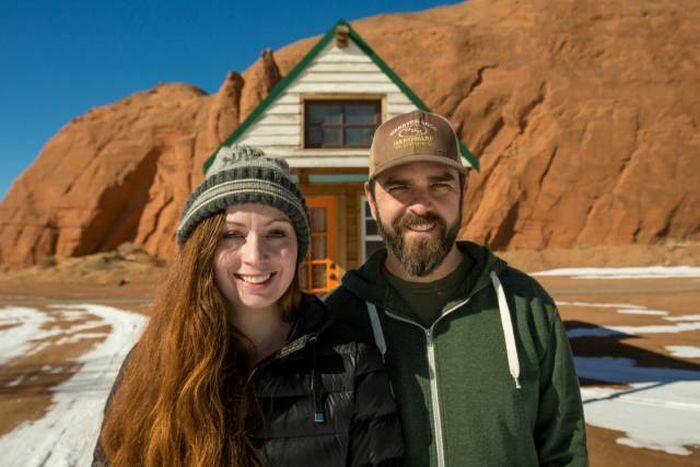 The couple saves money on campsites by parking alongside their film subjects. 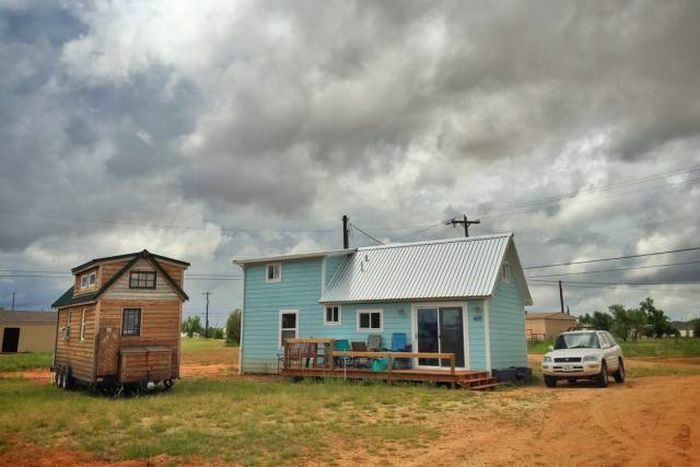 In Spur, Texas, they found a community of tiny homeowners who want to make their small town the tiny house capital of the US. There will be 20 homes by the end of the year. 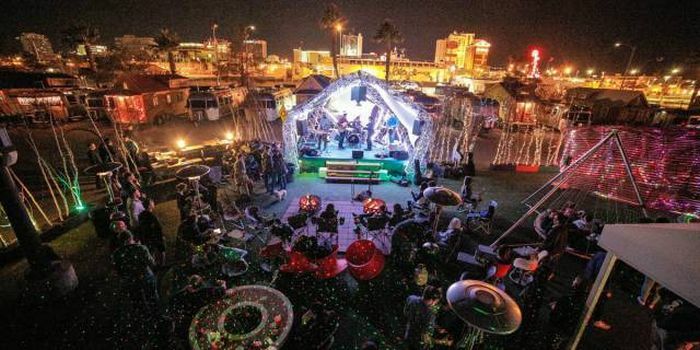 Outside Las Vegas, Nevada, the couple had the time of their lives at Llamapolis, a community of Airstreams trailers and tiny houses. 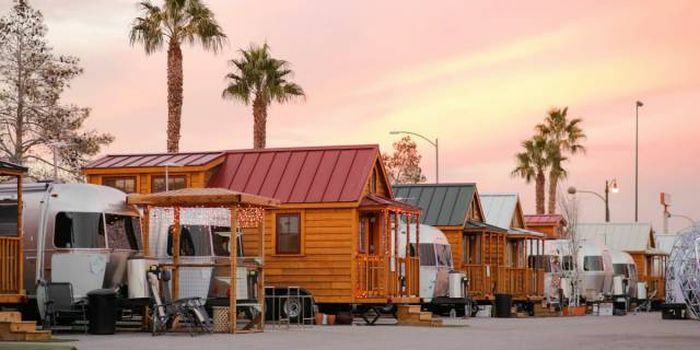 The Zappos CEO calls it home. 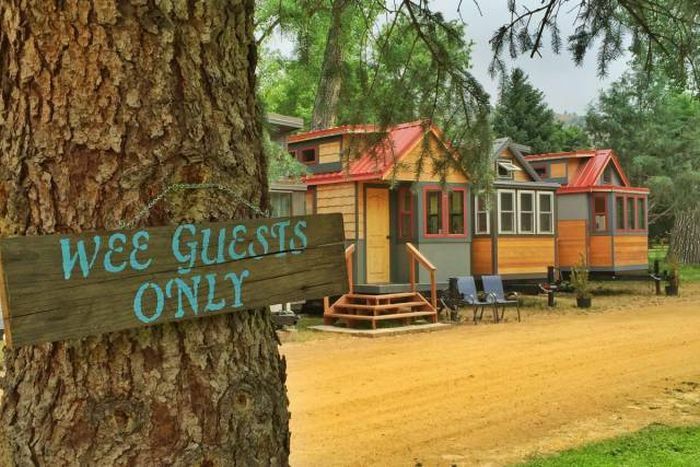 "All the houses face inward toward this common area so that there are all these spontaneous social encounters that happen every single day," Alexis says. And sometimes, they find themselves parked in the middle of nowhere. 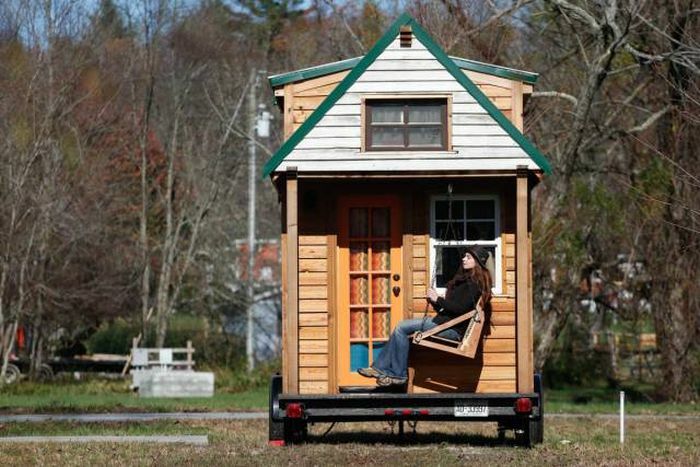 Many cities effectively ban tiny houses in their zoning laws. 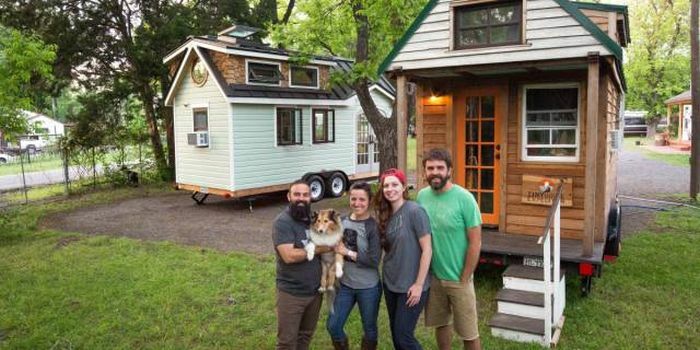 Alexis and Christian learned that across the country, tiny homeowners living in stealth find support in meet-up groups. You can learn more about Alexis and Christian's documentary film on their project website (see link below).